"Makes a living by travelling, talking a lot and sometimes writing stuff down. Galericulate author, polymath and occasional smarty-pants." John Dolan and 1 other person liked Olga Núñez Miret's blog post: #Bookreview A CHANCE AT CHRISTMAS by Beppie Harrison (@BeppieHarrison) Recommended short feel-good #Christmasstory set in the Regency period. We’d love your help. 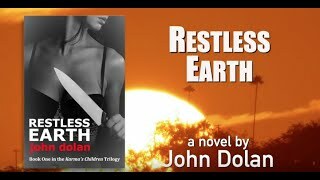 Let us know what’s wrong with this preview of Restless Earth by John Dolan. Imaginative, witty, erudite. A canter through several decades of British decline seen through the eyes of various families. Believe the hype. Fantastic. We’d love your help. Let us know what’s wrong with this preview of White Teeth by Zadie Smith. "It is a truth universally acknowledged, that a single man in possession of a good back-catalogue of popular novels, must be in want of a wife." When visiting author Ewan Lovatt makes the mistake of casually criticizing Kate Pease's scones, it seems l "It is a truth universally acknowledged, that a single man in possession of a good back-catalogue of popular novels, must be in want of a wife." We’d love your help. Let us know what’s wrong with this preview of Sweet Pease by Cameron D. Garriepy. Blak wrote: "Nice to meet you, John! All the best. :D"
Tompopaageo wrote: "John wrote: "Tompopaageo wrote: "Hey John, thanks for the 'friendvite', looking forward to checking out your books and reviews." You are extremely welcome - especially so as you are from my part o..."
John wrote: "Tompopaageo wrote: "Hey John, thanks for the 'friendvite', looking forward to checking out your books and reviews." You are extremely welcome - especially so as you are from my part of the world. ..."
Tompopaageo wrote: "Hey John, thanks for the 'friendvite', looking forward to checking out your books and reviews." Hey John, thanks for the 'friendvite', looking forward to checking out your books and reviews. Carole wrote: "Hi thank you nice to know you." Hi thank you nice to know you. D.E.M. wrote: "Thanks for the recommendation on The Steward by Christopher Shields, John! How's all with you?" Hey, thanks! I'm good. As usual not enough time for writing, but that's life. How's 2013 treating you DEM? Thanks for the recommendation on The Steward by Christopher Shields, John! How's all with you?